So remember the 'Please let my family all stay well' from the last post. I jinxed myself LMAO. Tonight we had our wonderful new neighbors over and DH and Steve hung at the house while Kim, A, and I headed to pick up a pizza. DH decided to make some potato chips and was using the mandolin and sliced a HUGS chunk from his finger. We couldn't stop the bleeding. Kim is the new PA at the clinic and tried, but 45 mins later DH was dripping blood through all the bandages. So I called Jen (one of the docs) and she happened to be at the clinic tonight doing some paper work. 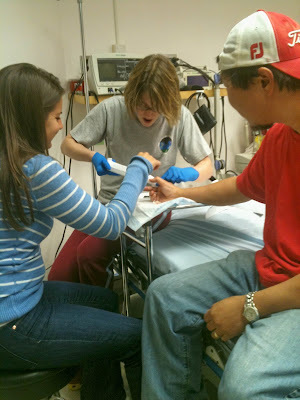 She wasn't the clinician on call but told us to come in. A stayed back at the house with Steve...who she ABSOLUTELY LOVES!! The rest of us headed to the clinic. His finger needed to be cauterized, but the pain was too great! 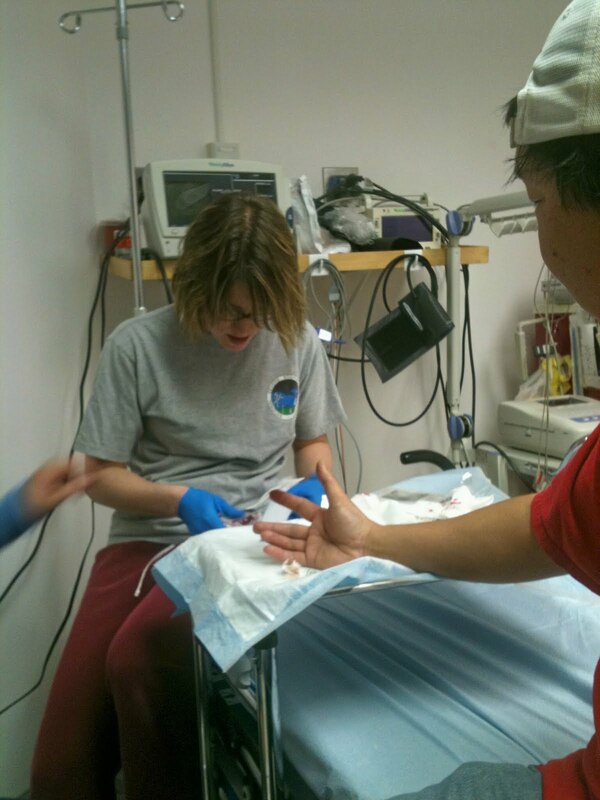 So 8 shots of Lidocaine later, they tried again. It still killed him as they used 2 different methods of cauterization. He was sweating and squeezing my hand so hard it hurt. I had to keep reminding him to breath. They finally got the bleeding to stop. 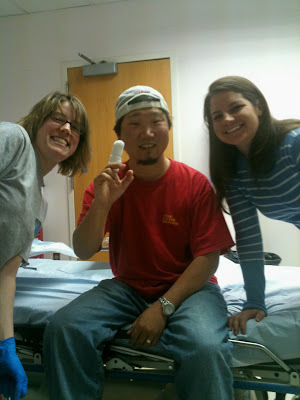 Neither Jen nor Kim had ever done a finger tube bandage before. It is nor wrapped around, but actually like a glove thing, and Jen was excited to try it. Usually the nurses do it. They use a pretty interesting apparatus to do this type of bandage and you can tell Jen was very impressed with herself! All done and all smile! Everyone happy and impressed with their bandaging work. A fun time for all LMAO. DH is doing okay. Right now we are all hanging out watching a movie. The numbness has worn off and he has a little pain but is doing ok. Crazy night! Alright, NO MORE!!!! I think we should be done right! ?